It’s that perfect time of year when the temps are cooler and the crowds are thinner. You can enjoy a quieter experience at your favorite Virginia RV park or campground. 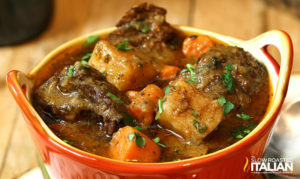 It’s also time for some good old comfort foods such as homemade soups, stews, and herb infused breads. You can buy many of these items at local farms, farm markets, and specialty shops. You can also enjoy making a delicious pot of soup or a memorable stew right at your campsite. We found some delicious Fall recipes to try. You’ll be trimming and cutting a 2 lb. chuck roast into cubes for this recipe. You’ll also need beef stock, Worcestershire Sauce, Italian seasoning, red potatoes, carrots, garlic, flour, salt & pepper, and olive oil. You’ll toss the beef cubes in a flour mixture and then quickly brown them in oil. Eventually, it all goes into a pot, which could be your Dutch Oven, and allowed to cook for at least an hour. When all is said and done the flavors of this soup will be infused throughout and you’ll love the comfort of eating a bowl on a cool Autumn day. This one has all our favorites cooked together into one delicious camping meal. Grab some thick cut bacon, chicken breasts, butter, flour, Belgian beer, chicken stock, shredded cheddar and some spices. You’ll cook the bacon as bite sized pieces and then remove them from the pan. Drain any extra bacon grease and add the chicken which is also in bite sized pieces. Brown the chicken and remove it as well. Add butter and flour to the pan for making your roux. Next comes chicken stock, cheese, and the spices. Now add the chicken and bacon back in the pot with the rest of the ingredients. It’s almost time to eat. You can serve this up with croutons as a garnish or sprinkle with more cheddar. So, very good! We hope your fall camping is memorable and your meals are enjoyable, too. Try these recipes and see if they don’t make your day even better. You can find the instructions for these and more at The Best Ever 25 Soups and Stews.